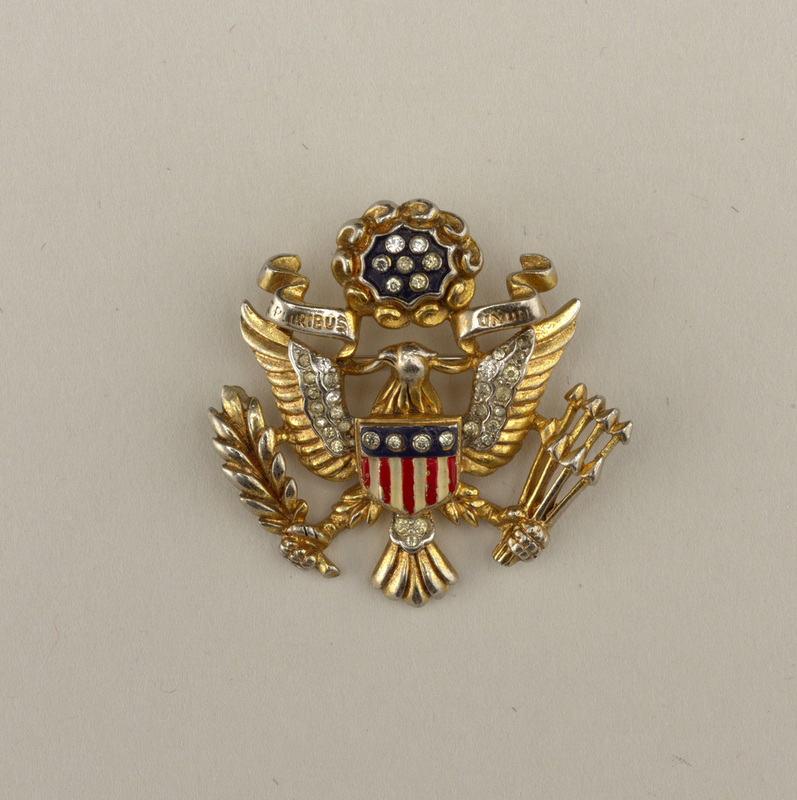 This U.S. insignia brooch by Trifari dates back to 1945, and is made from gilded metal and glass. Wearing a pin designed after the country’s seal was an opportunity for women to express their patriotism, especially in 1945, a time marked by victory in Europe and Japan. This brooch is part of a wider trend of patriotic jewelry issued by Trifari and other jewelry manufacturers. These brooches, pendants and bracelets were not only purchased by women, but by their husbands, brothers and boyfriends as well. Known as “sweetheart jewelry” these pieces were worn in recognition of men in the wearers’ personal circles who had served their country as well as in general support of American troops. In addition to the insignia there were pieces honoring the navy, the signal corps, Uncle Sam top hats and bows mimicking ribbon of the stars and stripes. Historically, sweetheart jewelry dates back to the First World War, serving as a connection between men overseas and loved ones back home. While a token in the First World War, the concept took hold during the Second World War with companies like Trifari and Coro creating pieces in patriotic themes. Production continued throughout the war years culminating with victory jewelry manufactured in 1945 that took the form of the country’s great seal, but also in the shape of ‘V’s adorned with red, white and blue stones. Despite economic hardships during the Great Depression and rationing during the war years, jewelry remained fashionable. At a time when cloth was rationed and clothing was unadorned, pinning on a brooch or wearing a locket gave the wearer a sense of style. Sweetheart jewelry from this pivotal point in United States history was made from a variety of materials. Due to metal rationing during World War II, Trifari was forced to switch to sterling silver instead of the base metal normally used in their products. This switch tripled the price of their products, but did not affect sales. Post-war, Trifari wanted to go back to a cheaper and maintenance-free metal but consumers preferred the sterling silver. In response, Trifari developed a “new” metal called Trifarium, a name the company invented for their base metal, which unlike silver, could be given a no-polish rhodium finish. The company also delivered fine costume jewelry to the growing middle class by using vermeil (a gold-plated finish) alongside faux stones like paste gemstones and imitation moonstone, chalcedony, and pearls. In this tale of patriotic jewelry, it is important to note that Trifari itself is a product of the American dream. It was founded by Gustavo Trifari, an Italian immigrant who arrived at Ellis Island from Naples in 1904 at the age of 20. Six years later he founded Trifari and Trifari with his uncle. His uncle left the company after a few years, and Gustavo continued under the name Trifari. By the 1920s, Trifari had become one of the most respected producers of costume jewelry in the United States. I just bought a piece for 2$ from a thrift store. It’s a heart Locket with star im middle. It has a banner that says “sweetheart in Service.” I don’t see any hallmarks. Looks like the original chain. It also has initials scratches in it, “To: R-O, From: K-E” Any Information on this piece?